After tantalizing us with the possibilities of delivery by drones, then bringing us back to Earth with delivery by taxis, Amazon has now resorted to perhaps the most obvious and time-tested method of getting something somewhere fast in a big city: bikes. 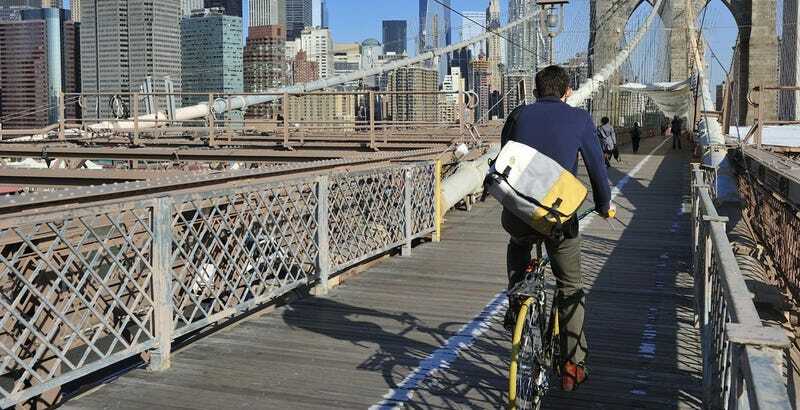 In New York City, Amazon has started to beta test bike messenger delivery, according the Wall Street Journal. The service is called Amazon Prime Now and "mimics the immediacy of in-store shopping by bringing some merchandise to customers in Manhattan within one hour or two." While bikes certainly won't be the most efficient delivery mode in every city, it makes perfect sense in New York. It's the same reason Uber rolled out a bike messenger delivery service in the city earlier this year. Perhaps even more interestingly, Amazon has built out a kind of bike messenger clubhouse in New York's Midtown where couriers are meant to hang out between deliveries. It has a foosball table and an arcade. But the space will also act as a warehouse for customers who can make returns there, if needed.